For acts of heroism not involving actual conflict with an opposing armed force. The Coast Guard Medal is awarded to any person serving in any capacity in the Coast Guard who distinguishes them self by heroism in a non-combat situation. It must be a voluntary act of courage beyond normal expectations and in the face of great danger. When awarded for lifesaving the act must have been performed at the risk of life. 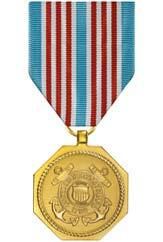 Authorized in 1951, the Coast Guard Medal was not produced until 1958.